MobileSmith is thrilled to announce two more awards won by our customers for their apps built in our platform. 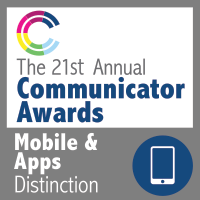 This time, it’s 2015 Communicator Awards of Distinction, won by our customers UCLA Health and Tanner Health System. With an impressive array of 11 mobile awards won over the past two years, our customers continue to prove that you don’t need to have programming experience to create a sleek, beautiful native app for customer engagement. 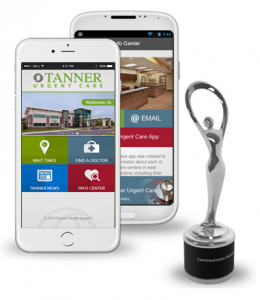 Tanner Urgent Care app is a native app available for iOS and Android smartphones, developed without writing a line of code. Find closest Urgent Care center to your location. Dynamic wait times for all Tanner Urgent Care centers. One-touch listings for all locations; maps and GPS directions. Searchable physician directory with tap-to-call. Tanner Health news & key contacts and information. 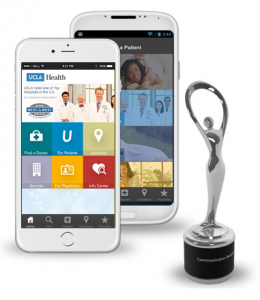 UCLA Health mobile app is a multifunctional general hospital app featuring a seamless physician directory plugin. It’s been deployed natively for iOS and Android phones. General UCLA Health info; map & directions; contacts. Searchable directory of services and specialists with tap-to-call function. Easy access to billing and insurance information. Research treatments, conditions and medications. Physicians can interact and refer people to the UCLA Health system. Year-round streaming content and push messages. All of our customers’ award-winning apps were competing against much more expensive, custom-programmed apps, and still won! Please join us in congratulating this year’s winners – @UCLAHealth and @TannerHealthSys. Ready to build your own award-winning app? Request a demo of our platform!